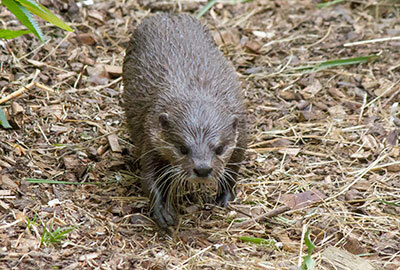 Harris, a male Asian Short-Clawed Otter, born in 2011 at the Welsh Mountain Zoo, arrived in early 2016 at the Cornish Seal Sanctuary. Harris was unfortunately ousted by his family and the team at the Mountain Zoo. However, he has settled in really well with his Otter partner Apricot at the Seal Sanctuary. Just click here or on the photo below of your choice to see a larger version. You can help support the work of The Cornish Seal Sanctuary as they care for their Residents and Rescued Seal Pups by joining the new Adoption Scheme. Click here for more information. Each Adoption makes a valuable contribution to the seal rescue programme, allowing the Sanctuary to provide continuing care for those seals and other marine mammals around our coasts that need our help and to look after those that are unable to be released back into the wild.